France has warned Prime Minister David Cameron that a referendum on Britain’s European Union membership is "risky" and “dangerous,” while German Chancellor Angela Merkel has indicated reforms are possible. French Foreign Minister Laurent Fabius issued the frank warning on Thursday, adding that Paris would reject Britain’s demands for a special status in the EU. Cameron visited France on Thursday as part of a four-nation European tour in which the PM seeks to gain support for his proposed EU reforms. Fabius issued the blunt warning in a radio interview broadcast shortly before the PM met with French President Francois Hollande in Paris. “One can’t join a football club and decide in the middle of the match we are now going to play rugby,” he told France’s Inter radio station. “If it is about giving a special status to Britain that gives it advantages for nothing, then the answer is ‘no’,” he added. Fabius expressed reservations about Britain’s upcoming referendum on EU membership, which could see the UK leave the union. “I find this process quite dangerous … The British population has got used to being repeatedly told: ‘Europe is a bad thing,’ and the day they are asked to decide, the risk is that they will say well you told us: ‘Europe is a bad thing,’” he said. France had its own experience of an EU referendum going wrong on May 29, 2005, when it held a popular vote to ratify the proposed European constitution, which was later abandoned. Europe’s third-largest economy voted against the constitution by 55 percent, despite opinion polls predicting a victory for the yes camp. Cameron met with Hollande after holding talks with his Dutch counterpart, Mark Rutte, at The Hague. 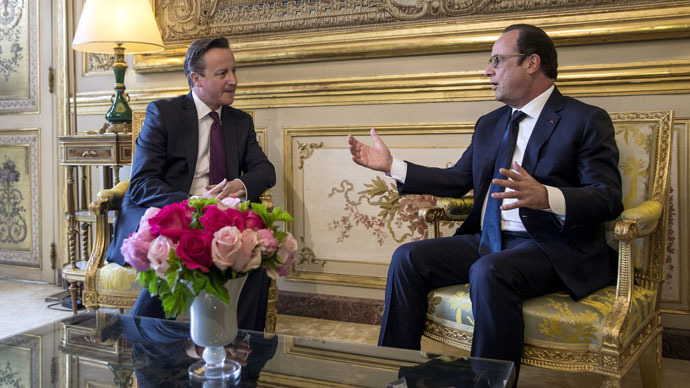 Hollande said it was in interests of Europe and the UK for both to work together. “We talked about Great Britain’s place in the European Union,” he said after meeting with Cameron. “France wants Great Britain to stay in the European Union. There will be a referendum and it will be up to the British people to choose what it wants for its future. “David Cameron will present his proposals and we will discuss how we can go forward so the British people can be able to make a choice that works for them,” he added. France’s far-right Front National party professed its support for the British PM’s efforts to reform the EU on Thursday. Front National was France’s second-biggest party in March’s local election, securing 25 percent of the vote. Led by Marine Le Pen, daughter of the party’s previous leader Jean-Marie Le Pen, the group seeks France’s withdrawal from the EU. Cameron failed to gain his Polish counterpart’s backing for one his key reforms, the restriction of benefits for migrant workers coming to the UK, when the two met Friday morning. Downing Street admitted the issue would need to be “discussed further” with Polish Prime Minister Ewa Kopacz. The PM will meet German Chancellor Angela Merkel on Friday afternoon on the final day of his European tour. Ahead of the meeting Volker Treir, deputy chief executive of Germany’s Chamber of Commerce and Industry, told the BBC German businesses were “astonished” the UK was holding a referendum on EU membership. UK Foreign Secretary Philip Hammond, who has warned that Britain will leave the EU if it secures reforms, said he expected European leaders to be tough in their talks with the PM. “We expect that some of our partners will adopt a hard line at the start of the negotiations. That is how negotiation works,” he said. In a press conference with Chancellor Merkel on Friday afternoon, Cameron said his desired reforms would require treaty changes, a move the French and German governments strongly oppose. “What we want here is changes that address the concerns people have. As we address these, people will see that it is right for Britain to stay in a reformed European Union,” he said.